Masterpiece in Burgundy, Made by American Furniture. 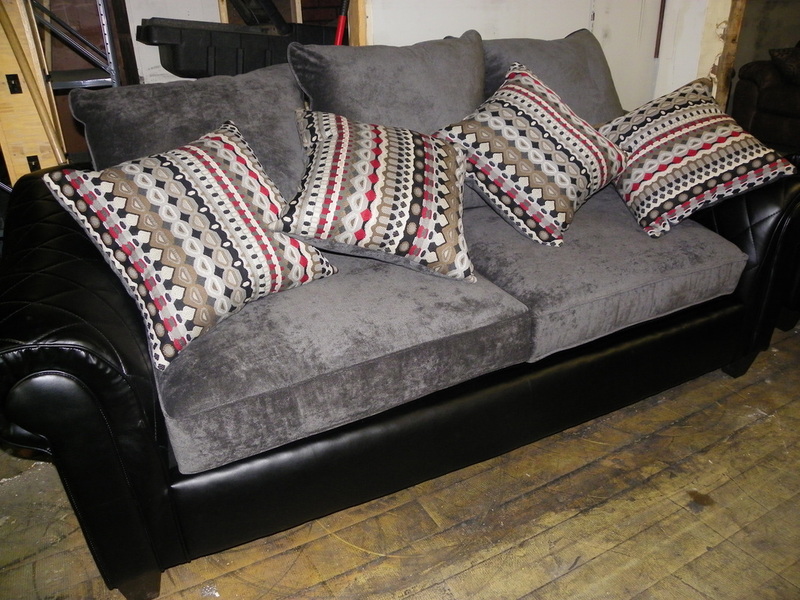 This beautiful stationary matching Chair 1/2 and Sofa are super comfortable, accent pillows included. New Era in black by American Furniture. 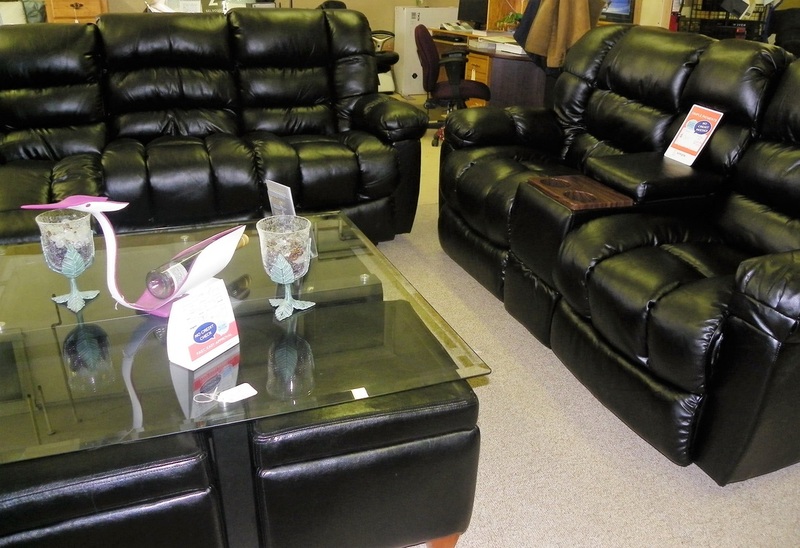 This 3 piece set includes a reclining sofa, reclining loveseat with console and a rocking recliner. Super comfortable and easy to clean. Pair with the coffee table, with storage ottomans to complete your living room. 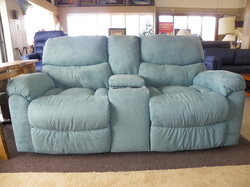 Montana mink, This 3 piece set comes as a power reclining set. With the push of a button you can relax to an almost full lying position. 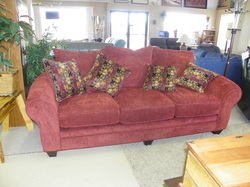 With the Loveseat with console and sofa there are USB charging stations included. Sit back, relax and charge any equipment that uses a USB cord. Two accent pillows included. Made in America by American Furniture. This stylish bistro table with four chairs is mixed with metal and wire brushed wood. Comes in a counter height size, will make a nice addition to your dinning room or kitchen. Dimensions: 45" diameter, 36" in height. Made in leatherette material, these ottomans would make a great Christmas gift for the tech lover. 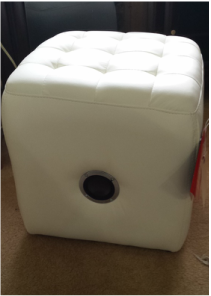 Each ottoman has two speakers, with a volume control, aux cord and also bluetooth. We have white, brown or black in color in stock.
" 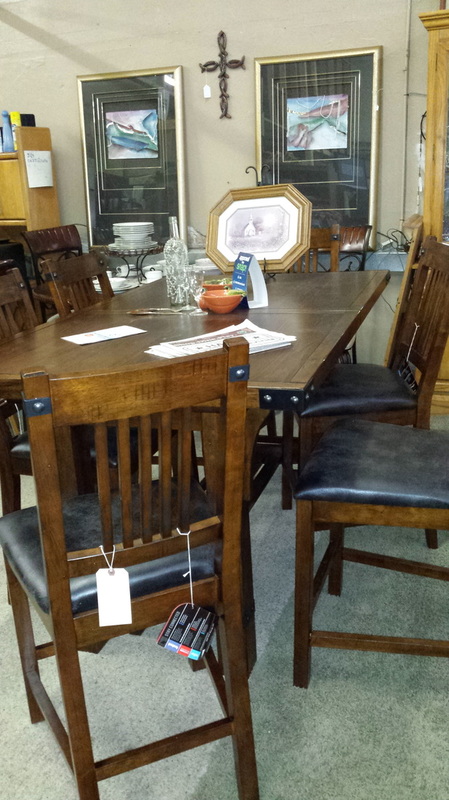 "American Furniture", Gillam's Furniture has added a new line of American made furniture to their store. Stallion Saddle, from American Furniture. 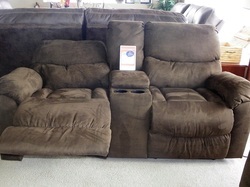 This set comes with a two cushion reclining sofa, reclining love seat with console and a recliner and a half. Super comfy and durable material, with a leather like feel. 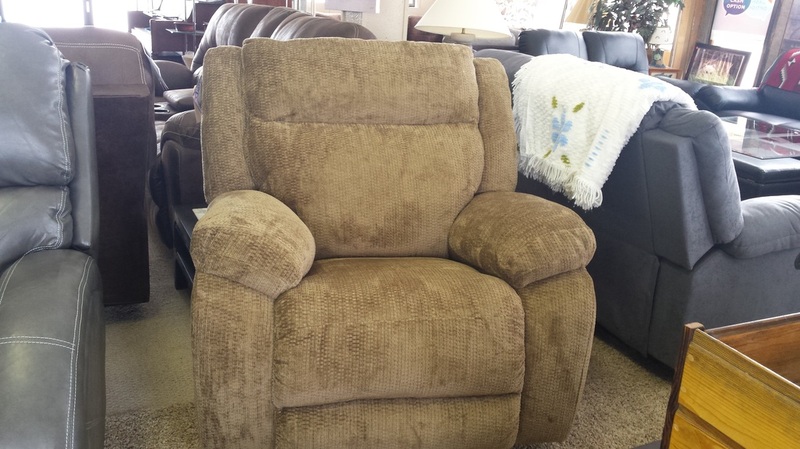 Temptation Fawn,also from American Furniture, This set includes a three pillow reclining sofa, reclining love seat with console and a recliner. Accent Pillows included. This smaller scale sectional is great for those smaller living areas. 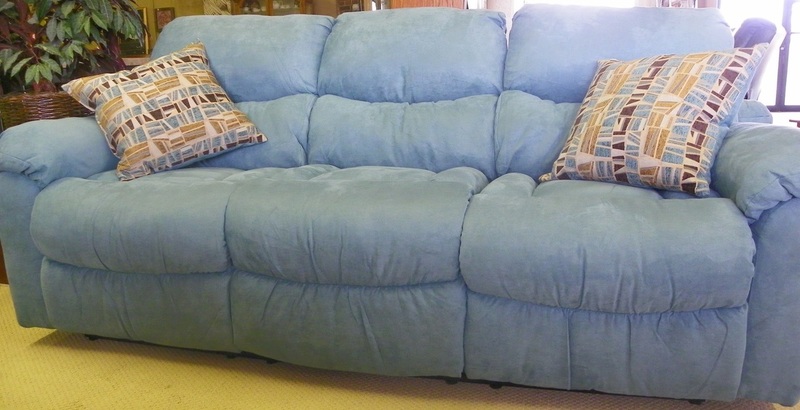 It is covered in blue fabric, also comes with storage and cup holders. 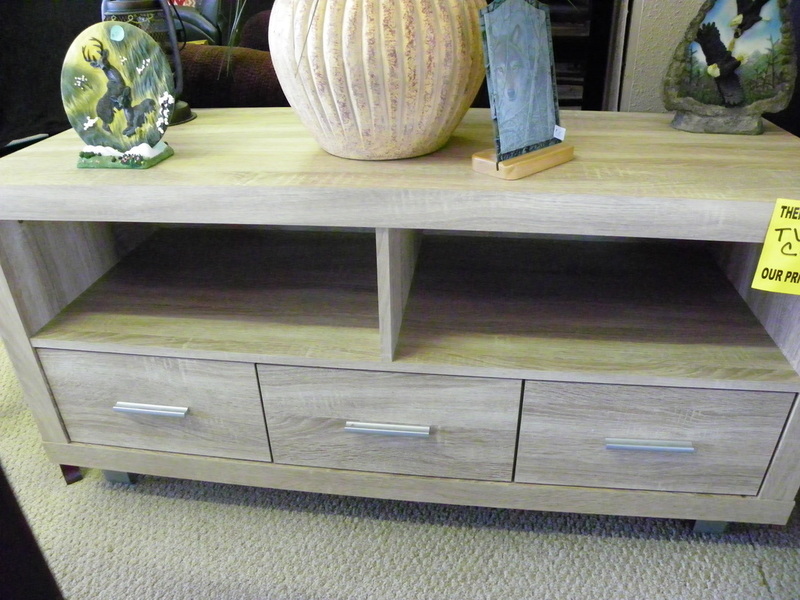 We have table sets to fit the smaller kitchen or dining areas. 5 piece casual dining set. Wine cabinets available in different styles and sizes. 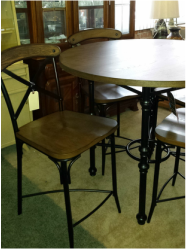 Beautiful counter height table with seating for 6-8 chairs, comes with a butterfly leaf, and padded chairs. Contact us if you would like to find out more about our current inventory or for special ordering.